The small Comet Hartley 2 is an oddball, for sure. 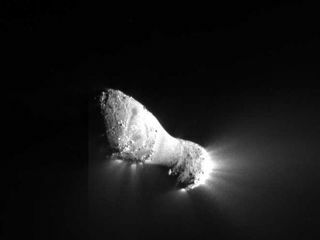 Two craggy bulges connected by a smooth waist (somewhat like a peanut), Comet Hartley 2 spews out more material than a comet just under a mile wide is expected to, a new study finds. And while most comets rotate slowly in one direction, Hartley spins rapidly as it tumbles. Furthermore, Hartley 2 contains an inexplicable amount of carbon dioxide, causing it to burp and even hock ice loogies into space. The new Hartley 2 discoveries are based on the latest analysis of observations collected during a November 2010 flyby of the comet by NASA's Deep Impact spacecraft as part of its Extrasolar Planet Observation and Deep Impact Extended Investigation (EPOXI) mission. During the flyby, the Deep Impact probe approached within 431 miles (694 km) of the comet, snapping photos all the way. "Among the comets visited by spacecraft, Hartley 2 is in a class by itself," the mission's principal investigator, Michael A'Hearn of the University of Maryland, told SPACE.com. For starters, its nucleus contains an abundance of carbon dioxide (CO2 — or, in solid form, dry ice). This is a volatile material — it burns easily — and so scientists would expect much more of it to have burned away in the 4.5 billion years since the comet formed along with the rest of the solar system. Hartley 2 swings by the sun every 6.46 years. It was discovered by astronomer Malcolm Hartley in 1986 . "The dry ice is what's driving the comet's hyperactivity," said Lori Feaga, a UMD planetary scientist on the EPOXI team. "It drives icy particles such as silicates, dust grains and water-ice out of the interior of the comet." It does this by acting like a pent-up fire hose, Feaga explained. "When the dry ice in the interior heats up, it changes to a gas, which is much less dense. As it expands, it creates an explosive force that pulls out other things with it as it tunnels through the nucleus to get out," Feaga said. The result is burps of gas and solid chunks. Strangely, though, Hartley 2 burps twice as much from one of its bulbous sides than from the other. The research is detailed in the June 16 edition of the journal Science. As icy remnants from the distant past, comets offer vital clues about the nature of the solar system's formation. "Understanding how comets work — what drives their activity — is crucial to the use of comets in studying the early solar system," the scientists wrote in their paper. But Hartley 2 works in mysterious ways. "We are still trying to sort out the implications for formation," A'Hearn wrote in an email. "The biggest remaining question, or at least the one that interests me most, is why there is so much CO2 in this comet and why it seems to differ between the two ends. [Is there] really twice as much CO2 in the small end as in the large end? And if so, does this mean that the two ends formed at different distances from the sun?" Feaga said: "Our assumptions of what drives a typical comet's activity, as well as what the composition of the primordial disk was and how much mixing occurred in the disk, have been turned upside down. We need to re-evaluate our theories." If the burping disparity means that one of the comet's ends contains twice as much dry ice as the other, then the two bulges probably were formed in separate places in the early solar system, and later collided and stuck, the scientists said. "In the solar system during its formation, there was a proto-planetary disk that was like a large Frisbee of rotating material," Feaga said. "The higher-density material like iron was closer to the sun, and the lower-density materials like ices were further out. So depending on the distance from the sun, we have this assumption for what existed there." Objects composed of different materials — like the two halves of Hartley 2's nucleus, perhaps — probably formed in separate places. Alternatively, the difference in how much gas and water seems to come from one end of the comet and from the other could relate to the hyperactive way the comet spins. "The highly excited rotational state might define some of the activity that we're seeing," Feaga said. More study is needed to sort out which explanation is right, she added. Natalie Wolchover is a staff writer for Life's Little Mysteries, a sister site of SPACE.com. Follow her on Twitter @nattyover and follow @Spacedotcom and on Facebook for the latest is space science and exploration.